Rubber stair treads designed for interior installations including panfilled concrete and wood steps. Featuring a horizontal rib pattern with optional grit non-slip insert or a ribbed rubber insert. I have a job site needing 180 of these rubber stair treads but wanted to know if there was a way for custom sizing them. How does this product hold up on exterior steps ? 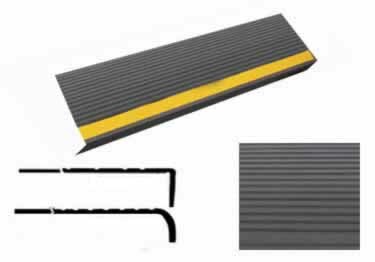 Rubber Stair Treads with Safety Site-line or non slip abrasive colored strip. Perfect for the low visibility areas in dark stairways. 70 colors to choose from. Great for interior stairs. Thank you for your review. We very much appreciate the nice words you had to say about the ease of installation. The product is great and was easier to install than I thought. Ordering was fairly easy but the delivery time was over 1 month. If you are not in a rush this is a good system. These treads went on very easy and are very durable. The stair Treads work very good. The frist order went so good we had to needed to order a secound time. The customer service I received was GREAT. Love it Love it. If you are looking to get stair treads this is the place to get them from. All Rubber Stair Treads (except Heavy Duty Target & Outdoor Rubber), trowelable, water base evaporation cure.